Dockers InterchangeHayden Ballantyne and is possibly out for the game. Demons InterchangeJake Spencer off due to an injury. Demons InterchangeShannon Byrnes and is possibly out for the game. Demons InterchangeJames Strauss and is possibly out for the game. Demons InterchangeSam Blease off due to an injury. Demons InterchangeJake Spencer off due to the blood rule. 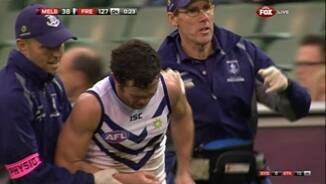 Dockers InterchangeAaron Sandilands off due to the blood rule. Pearce unloads from just outside 50, the wind carries his kick further than he anticipated and it goes out on the full. BEHIND FREOWalters has the ball 20 out on a tight angle, he attempts the snap in heavy traffic but his kick misses to the near side. BEHIND FREOPavlich lines up 40 out on a 45 degree angle, he unloads but it's a shocking kick off the boot, it starts left & stays left. BEHIND FREOJones has the ball deep in defence, he is heading towards goal & in the end he handballs it through for a rushed behind. 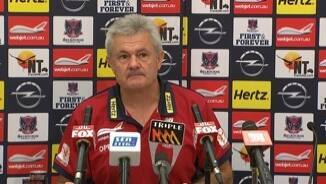 Melbourne have had just the 4 disposals and Viney has had 3 of them!! GOAL FREOThe ball comes inside 50 & Pavlich can't take theground, Ballantyne picks up the ball at ground level, he snaps from 30 & gets the Dockers' 2nd! GOAL FREOPavlich with the long ball inside 50 & Sandilands takes the strong contested grab, he lines up 15 out pretty much straight in front & threads it through! We are underway here at the G, it's a scramble in the middle & de Boer wins a free for being taken over the shoulder. Welcome to the MCG where Melbourne host Fremantle. 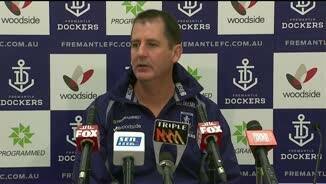 Freo will most likely dispose of the Demons with ease & have another percentage boosting win. Welcome to MCG for the Melbourne v Fremantle Round 21 clash. RUCKMAN Aaron Sandilands was subbed off with concussion in a concern for the premiership hopes of Fremantle, who cruised to a 95-point win over Melbourne on Sunday. Fremantle's 20.13 (133) to 5.8 (38) victory keeps the Dockers only half a win away from second-placed Geelong with two rounds remaining. Zippy small forward Hayden Ballantyne appeared to suffer an arm injury as he jogged off late in the game in pain in another possible concern for the Dockers. The round-21 clash, which at times was little more than a training run for the Dockers, attracted a tiny crowd of 13,768 fans at the MCG. Ballantyne and skipper Matthew Pavlich booted four goals each for Fremantle while David Mundy dominated midfield and athletic big man Zac Clarke was also influential in the absence of Sandilands. Nineteen-year-old Jack Viney with 28 disposals was one of Melbourne's better contributors as the Demons suffered their 18th loss from 20 games. Melbourne's 103kg defender Jake Spencer ran with his back to the ball and crashed his forearm into Sandilands' head during a marking contest early in the first term in an incident which will be assessed on Monday by the Match Review Panel. The 211cm Sandilands left the field looking unsteady on his feet as blood streamed from a gash on his forehead, which appeared bruised and swollen. Fremantle led by 27 points at quarter-time after holding the Demons goal-less in the opening term. The Dockers slammed on another five goals in a six-minute burst to jump out to a 50-point lead at the 17-minute mark of the second term, but the Demons scored the last three goals of the half to narrow the margin to 31 points at halftime. Fremantle stretched their lead to 58 points at three-quarter time after a five-goal third term to Melbourne's solitary major. Nathan Fyfe's goal just before the siren, after a frustrated Lynden Dunn crashed into his back and conceded a 50-metre penalty, was one of several disciplinary lapses from the Demons in defence. 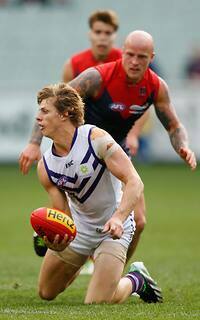 Fremantle helped themselves to another six goals in the final term to Melbourne's one behind. The Dockers host top-eight rivals Port Adelaide next Saturday while Melbourne face Adelaide at AAMI Stadium on the same day.